Powered by 3 AA batteries, the LPK25 optimises bluetooth technology to create the perfect travel keyboard controller. The keyboard features 25 velocity-sensitive mini-keyboard synth-action keys. There are also 4 onboard programmable memory banks, an on-board arpeggiator function and dedicated octave up and down buttons. The controller can be used with any iOS and Mac bluetooth devices or it can be connected via USB for a traditional controller setup. Experience the power to produce whenever inspiration strikes with Akai Professional’s LPK25 Wireless. Measuring at under 15” and weighing in at just over 1lbs, LPK25 Wireless fuses core keyboard functionality with an ultra portable footprint that easily fits into a laptop case, backpack or messenger bag. With a bullet-proof Bluetooth ready specification that covers a 30 meters range coupled with on-board power via 3 AA Batteries, LPK25 Wireless empowers mobile producers and performers with the unrestricted freedom to create, underpinned by a travel-friendly, satisfying production experience suitable for iOS, Mac OS X (Bluetooth LE4 & USB)and computer-based creation alike. Welcome to production anywhere. Akai Professional’s legacy as the leading manufacturer in keybed technology is iconic. 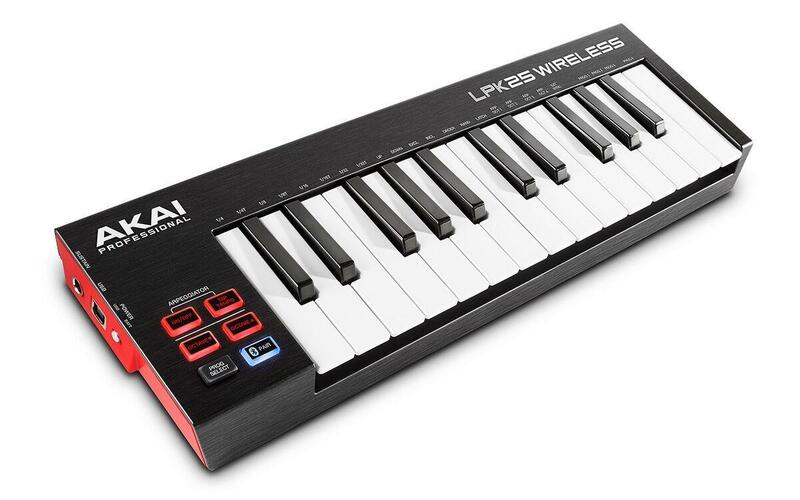 Centre stage on the LPK25 Wireless are 25 velocity-sensitive mini-keyboard synth-action keys, expandable to the full melodic range using dedicated Octave Up and Octave Down buttons –perfect for playing bass lines, lead parts or chord progressions. For instant inspiration and rapid generation of melodic motifs, LPK25 Wireless includes a full-featured on-board arpeggiator–fully customizable by range, arpeggiator mode and time divisions for total, empowering users to create unique melodic and harmonic riffs in seconds. At Akai Professional we understand your production and creative process is unique. With LPK25 Wireless, 4 onboard programmable memory banks are available for instant recall of personalized arpeggiator configurations –manage tempo settings, arpeggiation type, range and mode for a controller experience that is specifically tailored to your production and performance preference. Plus, store and manage all your programs using the LPK25 Wireless editor software for Mac and PC (download) for a performance platform that readily adapts to whatever the situation demands. Whether you’re an iOS producer or a computer-based DAW user, LPK25 Wireless’ class compliant specification guarantees seamless, effortless integration into your production setting without the added nuisance of installing drivers. No batteries, no problem! 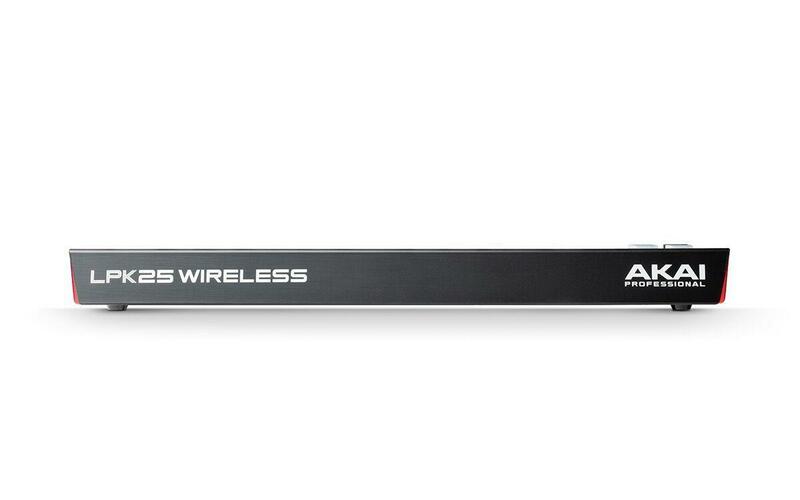 LPK25 Wireless connects to your PC or Mac via USB for a traditional control-based production experience. Loose the wires without loosing control –LPK25 Wireless’ seamless, ultra-stable BluetoothLE4connection (iOS and Mac OS X Only) with intuitive pairing empowers users with an unrestricted production experience, freeing you to sit back, relax and focus on what’s important –your performance!